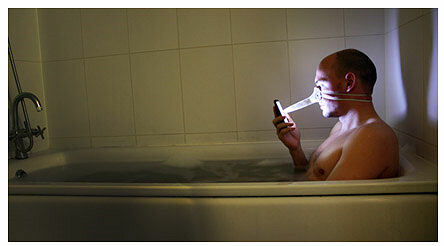 I sometimes use my touchphone in the bath. I know it's stupid. One problem I encounter is that when I put my left hand in the water without thinking, it gets wet and unusable for touchscreen navigation. It's too risky to try to hold and navigate with one hand. I found that I could use my nose to scroll but I couldn't see where my nose was touching precisely. It was at that point that I came up with this idea of a nose extension 'finger' that would allow navigation while my phone is firmly held by one hand. Mr Wilcox doesn't own a towel?